Namwali Serpell. Born in Lusaka, Zambia. The ethereal forms a distinctive layer of her prose and her writing is delicate and brittle in a rich and rewarding way. She relocated to the US in 1989 at the young age of nine where her eventual studies in Literature took her to both Harvard and Yale. Currently an Associate Professor of English at the University of California, Berkeley, her research interests are in contemporary fiction and film. 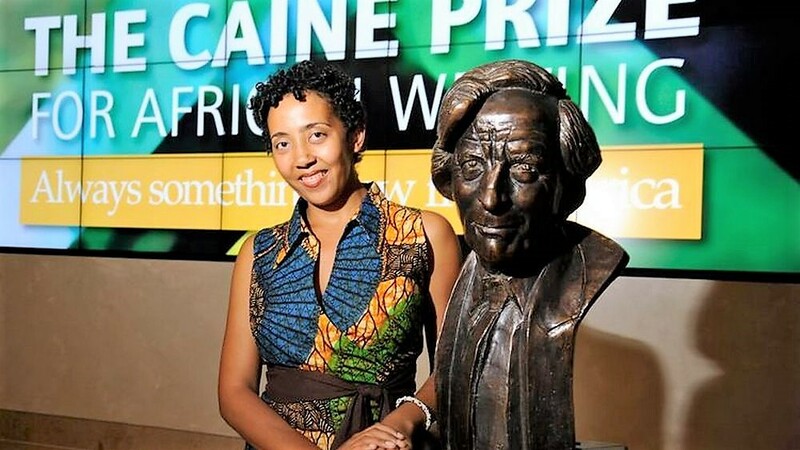 A recipient of the 2011 Rona Jaffe Foundation Writers’ Award and the 2015 Caine Prize for African Writing, Serpell proudly identifies with the contemporary generation of Zambian authors. Her highly anticipated debut novel, The Old Drift, is forthcoming from Penguin Random House (Hogarth). Namwali Serpell answered a few questions posed by Abenea Ndago. ABENEA NDAGO: We cannot begin without naming the elephant in the room. Perhaps you want to let us in on whether the three families are still battling vicissitudes of the first century, or if their descendants are already in the second. NAMWALI SERPELL: The novel, yes! The Old Drift’s earliest event is around 1850, and its latest is 2050 or so. The three families intersect briefly in the first century at what was called The Old Drift, a colonial settlement on the banks of the Zambezi near Victoria Falls. The repercussions of that collision play out over decades in each family line until the descendants meet again—and get tangled up—in the next century. I trace how a fluke of fate in one generation ripples across subsequent generations; how repercussions can play out indirectly—not through a direct act of vengeance or punishment, but a long term, oblique reckoning. ABENEA NDAGO: You consider yourself an African writer. It is a point you have made very clear in a past interview. But before that, you are a Zambian writer. The question I would like to ask is related to a nagging issue echoed in the views of two people. No doubt you have interacted in some way with James Currey (Africa Writes Back), and Ranka Primorac’s cheeky research entitled ‘Lazyman’s Clinic’ (Popular Culture in Africa). When you read Ranka, you hope that somehow, she will dispute Currey. But in the end, she does not. I would like to hear what your opinion is on the constant depiction of Zambia as Africa’s literary lightweight. Does it irk you? NAMWALI SERPELL: Yes, I’ve read Ranka’s essay and quite like it. It evokes the rhythms and feel of Lusaka beautifully, and how words—information, rumors, writing itself—circulate in these smoky, circuitous ways at home. It doesn’t irk me that we’re depicted as lightweights, especially since most of the Anglophone countries are treated that way with the Big Exceptions of Nigeria and South Africa. Rarity can be an opportunity and I have always rooted for the underdog! I do object to the idea that contemporary Zambian writers like me, Ellen Banda Akua, or Efemia Chela must somehow take on the responsibility of developing Zambia’s “reading culture,” whether it be through educational or philanthropic efforts. While I am a teacher, and I do enjoy sharing work with young people at home and abroad, it should not fall on the shoulders of writers to do this work when we are already engaged in the labor of writing and publishing our work while supporting ourselves and our families. I should note, too, since this comes up frequently, that though I am a Zambian writer who reads African literature, I am not a scholar of African literature, as Ranka (a Croatian who lives and teaches in England) very much is; my PhD is in British and American literature and that’s what I teach and write about. That is, one’s expertise is not always mapped to one’s identity. I can be a Zambian writer without being a scholar of Zambian literature, or a teacher of Zambian students, or a fundraiser for Zambian publishing initiatives. ABENEA NDAGO: Does this issue – even if unconsciously, in your view – inform your starting off with a novel that is practically an epic? Does the work try to do catch-up? NAMWALI SERPELL: I won’t lie. I do feel a responsibility to tell a tale that isn’t as well known in the world. But this is less because I’m catching up or trying to catch the world up—again, literature is not primarily a pedagogical or didactic tool—and more because much of this history and culture is so fascinating and wild and so quintessentially Zambian. ABENEA NDAGO: That leads me to the issue of language in African Literature. One tends to agree with Ranka, that part of the reason Zambian Literature lagged behind (before your 2015 Caine Prize win resuscitated it) has a lot to do with Stephen Mpashi’s decision to stick to his Bemba mother-tongue as a tool of trade. Of course, Dominic Mulaisho and the others later tried to inscribe a linguistic shift. How should the debate about language and African Literature be constructed? Does it matter? NAMWALI SERPELL: I speak and write in English with Nyanja, Bemba, and Mambwe words sprinkled in—these are the languages that were around me growing up. I am excited about the possibility of having my work translated into the seven main languages in Zambia though I am not up to that task myself since I lack fluency. The larger question about African language literature has been circulating since the very first African Literature Conference in 1962. It’s still an open one, which is probably productive, though it gets old. As I discuss in this piece on the NYRB, the way it often manifests among contemporary writers is in whether or not to gloss. My sense is that putting the terms as a debate with two sides, one of which will win, is a bit of a distraction from the work we could be doing to think around or through the question in formal terms, through literary play or experiment. ABENEA NDAGO: You are a cryptic author. You tell in signals. I like the way the relationship between Chanda and Isa alludes to the poignant theme of race in you short story, ‘Muzungu’. Even in ‘The Sack’, one has to be very careful what J. and Naila stand for. Does ‘the cryptic’ define you? NAMWALI SERPELL: Well, I wouldn’t say that the “cryptic” defines me. Those two stories are certainly at different ends of the spectrum when it comes to what is left unknown, and I have some very straightforward stories. But I wrote a scholarly book on literary uncertainty, so it’s certainly an interest of mine! I’m intrigued by the uses of ambiguity, of withholding or misdirecting the reader—it affords many distinct aesthetic and emotional effects. ABENEA NDAGO: Sci-fi is widely acknowledged as sometimes predictive. Do you think that is what African writing needs more of at this time? NAMWALI SERPELL: I think writing, African and otherwise, needs more of everything! We are in a moment where not only is a profusion of different styles and genres desirable to audiences, but it is also immensely generative when it comes to storytelling and political possibilities. ABENEA NDAGO: Your Facebook satire, The Book of Faces…social media has become an influential factor in our lives now. It sounds increasingly like something from sci-fi, especially now that allegations abound that it has been exploited to manipulate voters in the world’s most recognisable democracy. Have your views shifted in any way since the story was published a few years ago? NAMWALI SERPELL: I find it interesting that the story feels both belated and highly relevant. On one hand, it dates itself—it is comprised primarily of verbal posts, while my Facebook newsfeed now is largely videos, photos, and ads; the thumbs up have been supplemented by emojis; people often turn off notifications that they have joined or friended or unfriended someone. On the other hand, the kinds of posts I parody—humorous, emotional, political, scholarly—and the emotions the narrator experiences—callousness, community, addiction, outrage—are all still familiar. And the larger crux around which the story revolves, which is how do we mourn online, feels like a live issue, especially in this age of perpetual disaster. The Old Drift takes up the question of political manipulation of the public through media in a different way, but my view essentially remains ambivalent. I believe our enmeshment with technology can be used equally for progressive or nefarious means. ABENEA NDAGO: In a Georgetown Lannan Reading interview, you once said “I read the way the story sounds in my head.” There is music in the way you read your work, a harmony in the sometimes cheeky interplay of sounds. How much of this music do you consciously write into your stories? Do you write some stories for the ear? NAMWALI SERPELL: I was referring there to accents, as I tend to slip and slide between American, English, and Zinglish accents in my mind and speech—I am a bit of a chameleon that way, the fate of the immigrant child. I write and edit all of my stories for rhythm and I’m drawn to sonic qualities that capture the feel or atmosphere of a moment—sharp or round syllables, and so on. This has partly to do with my interest in synaesthesia, the way the senses can dissolve into one another, and sensory affects in general. One of my goals is to prompt bodily reactions in the reader—laughter, disgust, shock, tears—and sound can help with that. ABENEA NDAGO: You said in an interview that a handful of what you have published so far – often categorized as short stories – are really pieces from your forthcoming novel, The Old Drift. Your award-winning short story, ‘The Sack’, is reportedly the concluding chapter of the novel expected in 2018. Are you not concerned that you have revealed too much by publishing so many excerpts – four so far? – from the novel? We even know the way it ends. Should ‘The Sack’ carry a spoiler alert? NAMWALI SERPELL: As it turns out, “The Sack” may not make it into the novel—it may be a kind of extratextual appendix to it. Many writers do this—Jennifer Egan’s “Black Box” follows the path of a character from her Visit from the Goon Squad; William Faulkner’s “That Evening Sun Go Down” recounts an episode from the childhood of characters in The Sound and the Fury. I do prefer to avoid spoilers for myself, but my novel is so wide-ranging and that story, as you say, so cryptic, that I don’t believe you need to worry about knowing the end in advance! After all, reader expectations are a gift to the experimental writer who wants to thwart them. And my highest aim is to be rereadable. ABENEA NDAGO: Does being a teacher of literature give you any unusual perspective or insight as a writer? NAMWALI SERPELL: Only insofar as I spend all my time immersed in literature. I get to read and reread great works of literature—to take them apart and see how they work with my students—and that constant exposure is a boon to my work and my spirits, a reminder of why I do it. ABENEA NDAGO: Considering your familiarity with the techniques and nitty gritty at play in every paragraph you encounter, are you still able to approach a book innocently and enjoy it for what it is without turning every encounter into an academic process? NAMWALI SERPELL: Yes! I often advise my students to “read without a pencil,” so to speak, without that itch to make notes in the margins. I do a great deal of pleasure reading. I swallowed Elena Ferrante’s Neapolitan quartet down whole with nary an academic thought, for example. It would be a devastating loss to me if I couldn’t do that. ABENEA NDAGO: Looking back at your formative period as a writer and the entries of that precocious little girl in her “little red book” – was it inevitable that you would end up the writer experimenting with form and genre today? NAMWALI SERPELL: Well, when you look at the story ideas I had, they do set the themes. “Gymnastics and Horses Don’t Rhyme,” a story about a girl trying to please both her mother and her stepmother who have opposed favorite hobbies, ends with a surrealist turn: an acrobatic performance on top of a horse. (It was a dream come true when I saw this film in Berlin decades later!). I am still drawn to the kinds of cultural conflict in a story about a British man in an American crime story—the plot turns on whether he was driving on the right or left side of the road next to the scene of a crime he claims to have witnessed. And you can see my fascination with genre fiction even then: there’s that crime story, plus a science fiction one about a technology that lets people read each other’s minds; plus a horror story that includes, I kid you not, a mirror scene in which MURDER is read backwards as REDRUM (I was an eight-year-old immigrant and had not seen or read The Shining). Now that I think about this, maybe I should have been—or will someday be—a screenwriter?! ABENEA NDAGO: How much say do you think we have as writers in the kind of stories we tell? Or is there something innate in us that steers our hearts and minds instinctively in the direction we must go? I do find that I am a compulsive writer. I once received a crushing blow from a writer I immensely admired. I was about twenty-three at the time and in graduate school. The comments I received on the work I’d sent in were so devastating that I cried for days and hid the pages away and resolved never to write fiction again. A few days later, walking through the snow to class, I saw a blue shadow under a bush and mistook it for a woman huddled on the sidewalk. That momentary simile (a shadow shaped like a crouching woman) reversed itself (a crouching woman mistaken for a shadow) and the lazy immediacy with which my mind began to spin out her story, why she was there, out in the cold and on the ground… I knew I would never stop playing this sort of speculative game with the world around me, with my dreams and memories. I thought, “if I can’t help it, I may as well write it down.” So I did. ABENEA NDAGO: For many writers there is sometimes the desire to write more of the kind of stories that brought us acceptance and recognition than to experiment with new modes. How do you overcome that temptation? NAMWALI SERPELL: I experiment because it makes writing interesting for me. It delights and excites me. As it turns out, my effort to keep my own boredom at bay trumps anyone else’s idea of what they like. This is why it is helpful that I have another paying job as an associate professor! ABENEA NDAGO: Do you still get rejection letters? NAMWALI SERPELL: All the time! Just last week, and the week before as well. But I get opportunities, too, often out of the blue. Given the shape of my career this far, I have had very unexpected successes and somewhat surprising disappointments. I recently came up with a metaphor with two friends that helps me accept my inability to control this. It’s like planting seeds in a garden of intention. Some people plant a seed and it grows into the desired plant, exactly when and where they wanted it to. Me, I eagerly dig in and plant seeds over here, and nothing happens, but then a season or two later something sprouts up over there, sometimes another flower entirely. It’s a lovely way to keep feeling hopeful. Keeping digging and seeding and watering. Eventually, something will spring up, and it’ll be a surprise, to boot! ABENEA NDAGO: In a response to how you started writing fiction, you once said “in some ways, I feel immigration itself was the inspiration for me to start writing.” You come from the southern tip of the African continent, a region where the history of migration still affects even presidential candidates’ legitimacy. How easy or difficult has it been for you to eat – in literary terms – from the menu of migrancy? NAMWALI SERPELL: My novel consciously reverses the tendency in immigrant literature to depict the experiences of Africans who move abroad to the UK or US. Instead I tell the stories of people who move to and within Zambia. My country has always been a very movious place, as we say, and this undercurrent has always destabilized any imposition of limits to where people go—whether that be through colonialism or the current powers that be. My own experiences with migrancy have been much easier than most, but of course troubled with the usual bureaucratic tangles about citizenship and visas and so on. I find hope in new initiatives to make travel within Africa more feasible, including changing visa regulations, better infrastructure of roads and rail, and more options for air and train travel. ABENEA NDAGO: Insects populate your stories – do you fear them? NAMWALI SERPELL: No, I adore them! I find them endlessly fascinating. I went to a science and math specialty program in secondary school and, for a while, I thought I’d be a biologist or a microbiologist. Spiders are my totem animal; they follow me everywhere but I’ve never been bitten. And though everyone loathes mosquitoes, I admire them, too—they are the unsung nemeses of mankind. The Old Drift takes that idea and runs, or rather flies, with it!